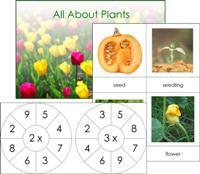 I downloaded and printed these Life Cycle of at Pumpkin cards at Montessori for Everyone. I cut and laminated the cards. After reading Pumpkin by Ron Fridell I laid out the cards and had Jacob put them into order. To keep Jake's interest I told him we were going to play farmers. I told him that the cards were our "plans" and we had to put them in order so we know what to do next. That worked, he was excited to start his farm work so he put the cards in order quickly. I feel it is important for him to know where his food comes from and to know the process that farmers go through growing crops. These cards are a great visual for learning the phases.